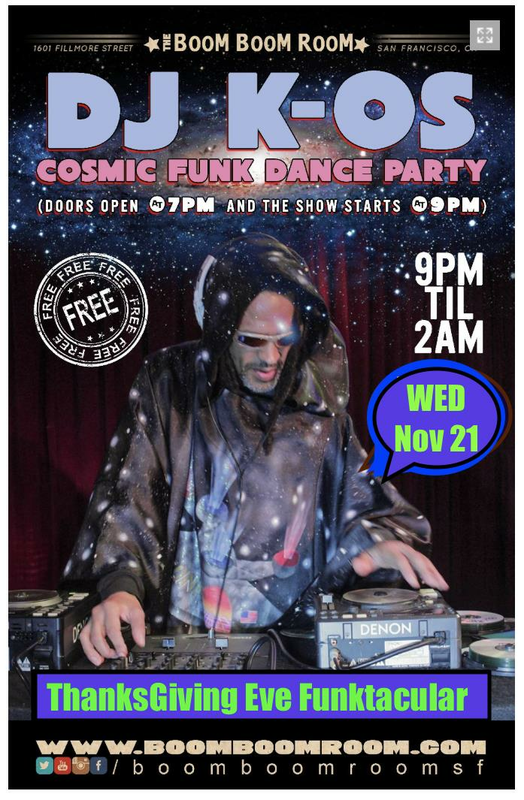 A Night of Cosmic Funk Disco brought to you by the former DJ Star of Digital Underground. DJ K-OS is set to light up the Boom Boom Room on Thur Night. His music collection of rare and eclectic Funk, Psychedelic, Rock, Punk, Reggae, Disco, New Wave, Jump Boogie, Hip Hop, Soul and Disco is so extensive and obscure and bad azz. The mash-ups of layers of sound and genre into dance-charged epic creations all his own, makes DJ K-OS not only a taste maker, but a musicologist extraordinaire. This is gonna be Hot! Born Anthony Bryant, K-OS grew up in West Oakland, an upbringing he described as “basic training in the ghetto.” He came across turn tables at house parties and taught himself how to scratch. After high school, he landed a job at the Record Factory, a music store on 26th Street & Telegraph in Oakland, where he traded scratching lessons for mixing lessons with assistant manager Terry Ward. By the time K-OS started to perform publicly a year later, in 1985, Aerosmith and Run DMC’s single “Walk This Way” began to make it socially acceptable for more diverse groups to listen to rap and rock. K-OS embraced the détente, spinning for up-and-coming bands like Primus at the now defunct Berkeley Square and moving past the overused breaks DJs leaned on. His watershed moment came in 1987. He was on his day off from the Record Factory when the manager called him in to DJ for George Clinton’s in-store promotion. K-OS scratched and mixed some of Clinton’s records for the man himself. Clinton, a performer K-OS was already drawn to and familiar with, saw first-hand the benefits of a skilled DJ.